Our bodies are composed of trillions of cells, and as you can imagine, this requires a hefty infrastructure, ranging from a skeleton of bones to support the entire body to a skeleton of proteins to support each cell. Adherens junctions form a key part of the infrastructure between these two extremes, creating the cell-cell connections that form tissues. These junctions form a physical link that reaches from one cell's cytoskeleton, through the cell membranes, to connect with the cytoskeleton of a neighboring cell. With help from some calcium ions, cadherin proteins form a zipper between the two cells. Inside the cell, a complex collection of proteins link cadherins to the cytoskeleton. The first link in this chain is well understood: the tail of cadherin interacts with beta-catenin in an interaction so strong that it forms even before the cadherin is transported to the cell surface. Then things get a bit fuzzy. Alpha-catenin, which can bind to beta-catenin and to actin, is a major player, but the interaction has been difficult to pin down experimentally. A direct connection has not been observed, and several additional actin-binding proteins, such as vinculin, may be involved in the process. (The illustration includes PDB entries 1l3w, 1i7x, 1tr2, 4igg and 3g37). 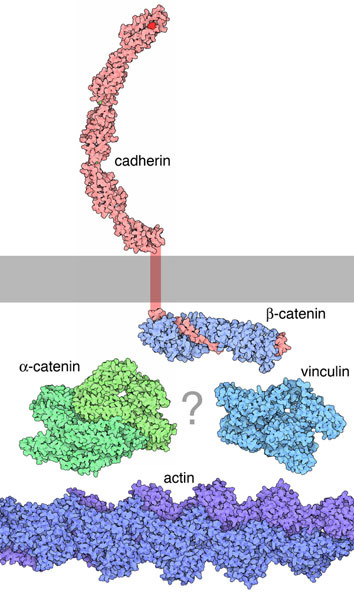 Both alpha-catenin and vinculin are dynamic proteins that adopt different functional shapes. By comparing the action of small peptides with the intact protein, PSI researchers have shown that alpha-catenin is normally in a closed, autoinhibited state, and vinculin unfolds the molecule, activating it. The same is true of vinculin--it is normally in a closed, inactive state, and requires other protein partners to pry it open before it will bind to actin. 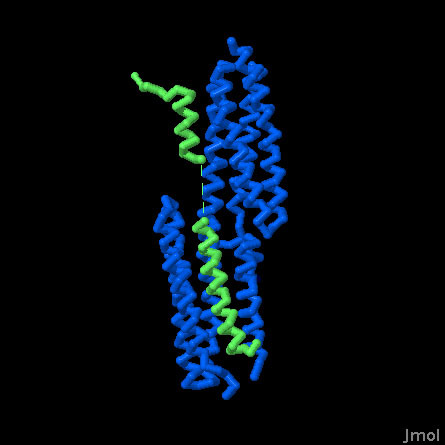 The structure of alpha-catenin (PDB entry 4igg) revealed a protein that folds into several functional domains, each composed of a bundle of alpha helices. Biochemical analysis has localized different functions for these different domains, including a dimerization domain, an actin-binding domain (shown here in yellow), and a vinculin-binding domain (shown here in green). The surprise came when the structure of the complex with vinculin was revealed. PSI researchers and researchers at the Scripps Research Institute have determined the structure of the vinculin-binding portion of alpha-catenin (PDB entries 4e18 and 4ehp) In the free protein, this portion folds into two alpha helices that pack side-by-side. In the complex, however, these helices straighten out and are aligned head-to-tail on the surface of vinculin. Two very different types of interactions are formed: at one end, the catenin helix pushes into a bundle of alpha helices in vinculin, but at the other end, the catenin helix rests more on the surface of vinculin. 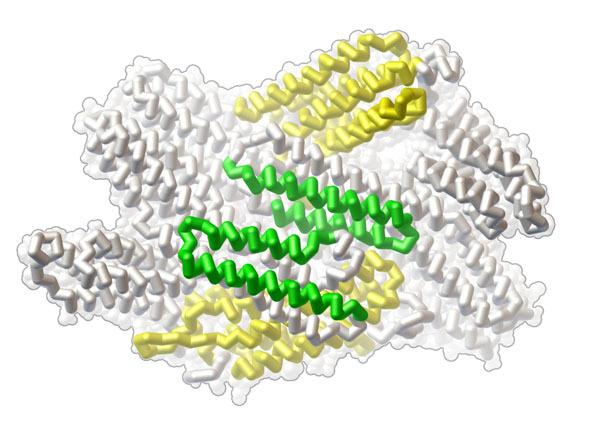 To take a closer look at this interaction and several other proteins that interact with vinculin, the JSmol tab below displays an interactive JSmol. Vinculin changes shape when it binds to its partners. In this Jmol, the vinculin head domain is bound to several proteins, including two structures of peptides from alpha-catenin, a peptide from talin, and a peptide from the bacterial protein IpaA. Compare this with the structure of vinculin alone and notice that the protein opens up to interact with an alpha helix from the partner protein. Choi, H. J. et al. alphaE-catenin is an autoinhibited molecule that coactivates vinculin. Proc. Natl. Acad. Sci USA 109,8576-8581 (2012). Rangarajan, E. S. & Izard, T. The cytoskeletal protein alpha-catenin unfurls upon binding to vinuclin. J. Biol. Chem. 287, 18492-18499 (2012). Rangarajan, E. S. & Izard, T. Dimer asymmetry defines alpha-catenin interactions. Nat. Struct. Mol. Biol. advance online publication (2012). Ziegler, W. H., Liddington, R. C. & Critchley, D. R. The structure and regulation of vinculin. Trends Cell Biol. 16, 453-460 (2006). Borgon, R. A., Vonrhein, C., Bricogne, G., Bois, P. R. J. & Izard, T. Crystal structure of human vinculin. Structure 12, 1189-1197 (2004). Boggon, T. J., Murray, J., Chappuis-Flament, S., Wong, E., Gumbiner, B. M. & Shapiro, L. C-cadherin ectodomain structure and implications for cell adhesion mechanisms. Science 296, 1308-1313 (2002). Huber, A. H. & Weis, W. I. The structure of the beta-catenin/E-cadherin complex and the molecular basis of diverse ligand recognition by beta-catenin. Cell 105, 391-402 (2001).